Styled with terre skirt . 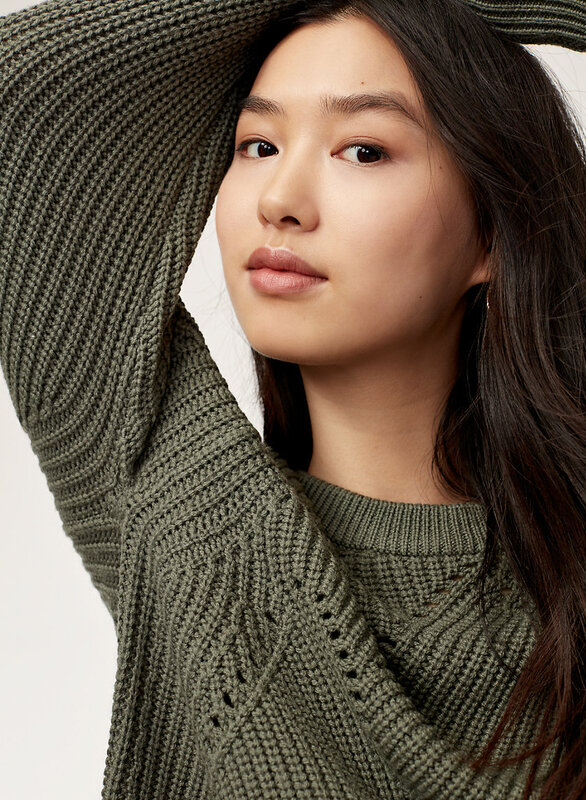 This cozy crewneck sweater is knit with fine, Italian-spun merino wool in a pointelle stitch, so it feels amazing and looks a little special. Love this sweater. 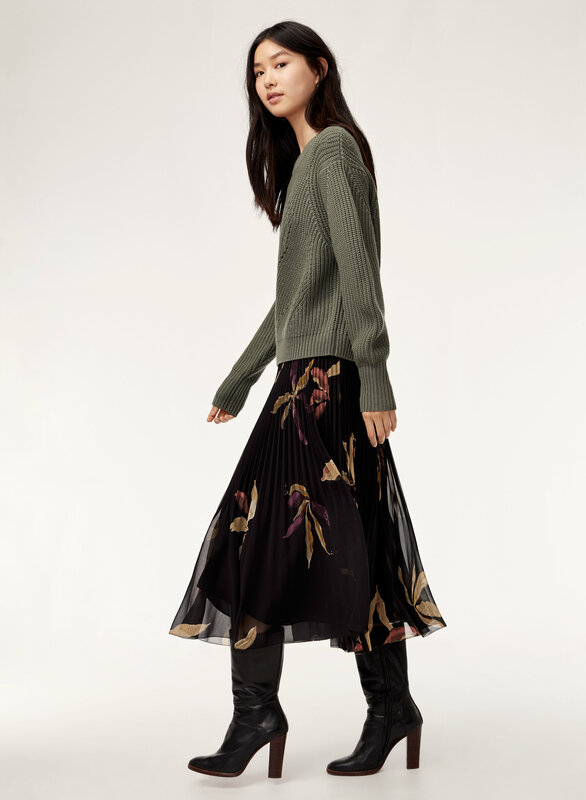 The colour (the dark mustard) is so good and the sweater is soft and detail is great. I went up from my usual small to a medium as I’m only a month postpartum, but it’s nohuge! I think I’ll still be happy with this oversized (ish) fit when I’m closer to my pre-pregnancy size. I have two of these sweaters and they're both very warm and cozy. A little oversized but I think that is how it's meant to be. They're also a little bit on the cropped side which makes them the perfect length to tuck into jeans. Taking off one star since they do pill pretty fast but other than that, I love them! This is a must have piece, good for winter or between seasons. I usually wear small but I purchased medium to achieve a baggy look. Like all sweater, just careful of the pulls - it can happen easily. I like the color and the style. Good for winter! It’s a very soft and light weighted sweater. And it’s super warm while the quality is very good. The fit is true to size. I got this in XS and in the lilac colour. I love the pattern and colour, however, I got my usual size and it fits a little small for my torso and arms. I wish I got a size Small instead. Took 2 stars down as because of the size, I don't wear this sweater that often. Was eyeing this sweater for months! Snagged in Tamarind when it went on sale. Was very pleased with the detailed stitching, ultra soft knit, and crop/bubble sleeves. Though I will say, the tamarind color is more army green than gold/ochre as anticipated. Will make it work. Fits TTS. I am 5’4”, 130#, size Small/4. Highly recommend! It is so warm! And soft! 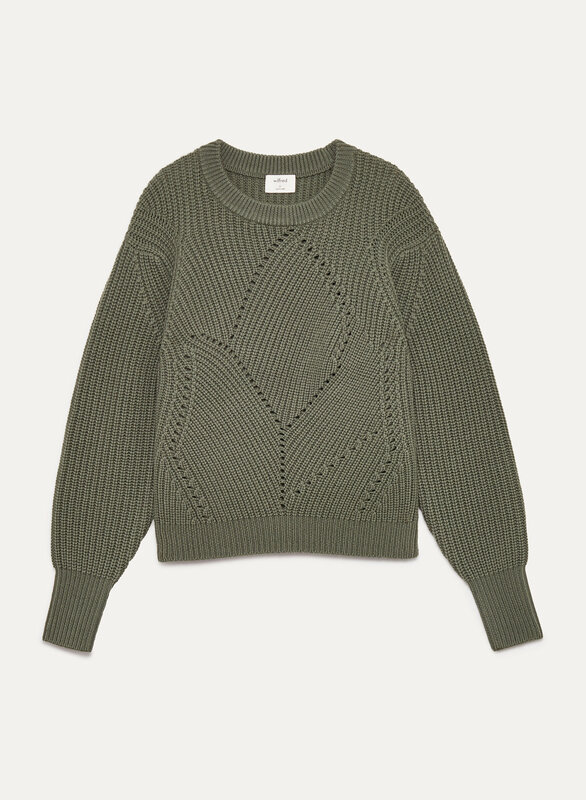 This sweater is really soft and 100% merino which is nice! Fits a bit large. However, the first time I wore it, a seam up the arm started to unravel. Beautiful Colour and nice material. I ordered online and it is a very nice sweater, but I didn’t love it. I am going to change it for a cashmere sweater. Love it. The color is so pretty. Wish it were longer. I would not have picked this sweater out online but I popped in a store on a business trip and ended up trying it on. While its cozy and thick, its not at all unflattering or itchy. I thought it was a cotton sweater by the feel of it. Also, the little eyelets are not big enough to require an undershirt. The tamarind color is lovely with dark jeans. I'm 5'8" and 140lbs - Id take a medium in a more tailored shirt. I have fairly broad shoulders/small chest - the Small fit perfectly. I am 5’1, 118lbs and got an XS in 2 colors: tamarind and a dark green (forgot the name). Fits nicely, material is not itchy, and super soft. Only drawback is it pills very easily after just one wear! I won’t be wearing it too often. I bought this to replace my Serment from a season (or two?) ago, in the exact same size and colour. As with my original Serment, the sweater is luxuriously soft, with beautiful detailing. I ordered an XS (5’4, 120 lbs), and found it to fit well, albeit slightly shorter than my previous Serment, and a touch tight in the wrists. For reference I found the proportions of the Small to be off on me- a touch more length but significantly looser in the top and body. 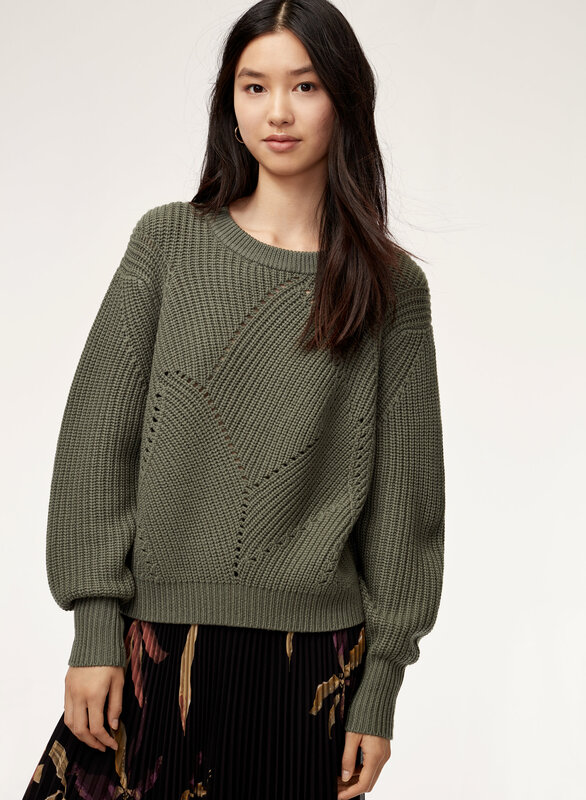 This is such a cute sweater! I love the detailing on it and the color is so beautiful. The knit isn’t itchy at all and is warm and cosy. I sized up because it does fit more true to size/smaller and I wanted it a bit bigger. Love how this sweater looks. Its very warm and cozy. I like a more loose fit so I went with the medium instead of a small. Happy with the purchase. The sweater arrived beautifully and carefully packaged, which was a pleasant surprise. And the sweater itself is not only gorgeous but comfortable, as well! So happy with this purchase!